Easily missed by visitors searching for fuel for their cars as there is no real forecourt, only a single pump on kerb in front of a building that doesn’t look too different from any other shop. Yet it is Bowmore’s only petrol station (or gas station for Americans). This entry was posted in Repost, Sunny Weather, Village and tagged Bowmore, Islay by Armin Grewe. Bookmark the permalink. @islayblog I’m guessing they don’t have super unleaded?! My Jaguar needs a splash & dash in Lochgilphead before the ferry. @gilesguthrie I don’t know I’m afraid. My car’s a diesel, so I never paid attention to petrol. Very familiar, that’s where my brother usually gets his diesel from. 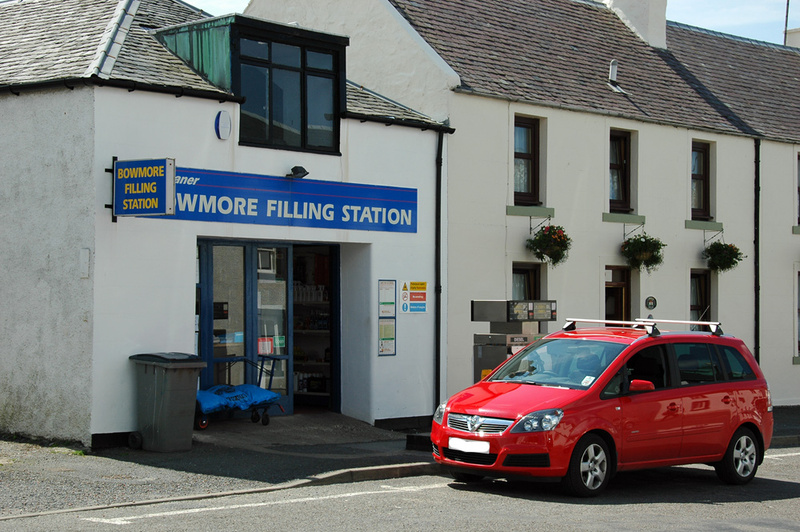 Is this the petrol station in a small road in Bowmore ? That’s the one. Jamieson Street to be precise.